﻿ Do Savings Bonds Make Good Investments? Do Savings Bonds Make Good Investments? Saving bonds make a good investment for people that do not have stock accounts, or are unwilling to open a stock account to buy a higher return investment. For that reason, they make great gifts to give to children that have time to reap the rewards of the compounding interest that is accrued by the bond. Here is a brief description of the two personal savings bonds that are available for purchase today. You can buy them online or through almost any bank or credit union. However, saving bonds will soon be available only through electronic purchase (starting in 2012). 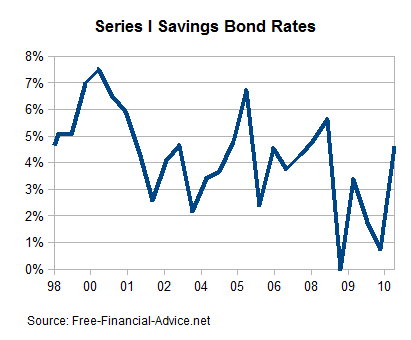 Series EE Savings Bonds. Series EE Bonds are purchased either electronically or on paper. Electronic bonds are bought at face value while paper bonds are bought at half face value ($50 face value for $25), however, both are worth the price that you pay initially and the paper bonds will not be worth their face value until they mature. Electronic purchases are delivered electronically to your account and paper bonds are mailed to you for you to hold. You can purchase a maximum of $5,000 worth of these bonds in any calendar year. These bonds must be held one year before redeeming, and if redeemed before five years, you forfeit 3 months of interest. Also, interest on these bonds is typically state and local income tax free. And they can be used without paying federal taxes on certain education and other qualified expenses. The most important aspect of these bonds is that they pay a fixed rate of interest. The interest is added to your account each month and compounded on a semiannual basis. Even if the interest rates are low, the government guarantees that your bond will double in value after 20 years. Furthermore, these bonds will pay interest for up to 30 years but no longer. 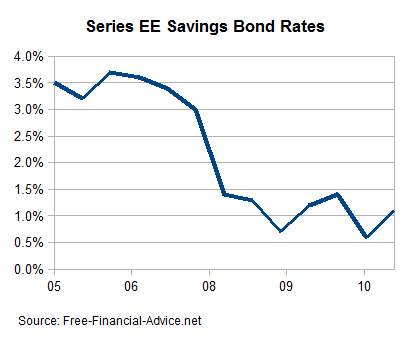 The current series EE bonds have been issued since 2005 (before that they were variable rates). Following is a graph that shows the historic interest rates. Notice that the yields on the EE bonds have ranged from just over 3.5% to almost 0.5%. These rates don't change after you purchase the bond, however, after a year you can trade in the bond for new EE bonds; or redeem the bonds and then purchase new EE bonds (if the current rates have risen significantly). When rates are high, the fixed rates in the EE bonds may be a good deal. Individual I Savings Bonds. Similar to EE bonds, I Bonds can be purchased directly into a treasury account or as paper bonds. However, all I bonds are sold at face value, and they pay interest at a variable rate. These bonds also cannot be redeemed for at least one year, and there is a three month forfeiture of interest if redeemed within 5 years. The bonds pay interest for up to 30 years before they fully mature. These bonds are tax exempt from state and local taxes, and if used for qualified education expenses, they can be tax free from federal taxes. The interest rate on I bonds is more complex than EE bonds. There are two components used to calculate periodic interest rates. The interest rates apply for six month periods and are then recalculated and applied to the next six months. The two components of the interest rates are a fixed component and an inflation adjustment. The fixed rate is currently at zero percent and the current inflation adjustment rate is 2.3%. The payout rate is calculated by adding two times the inflation rate to the fixed rate and then adding the inflation rate times the fixed rate to that. Because the rates are tied to inflation, these bonds make great hedges against inflation and guarantee a positive real return on your investment. Here is a graph illustrating the historical I bond rates since the current program was launched in 1998. Notice that rates have fluctuated wildly, from over 7% to 0%. In deflationary times, the rate will often be zero percent. In particular, during 2008, the rate went from over 5% to 0% with just one recalculation. Overall, these bonds are good hedges against inflation and will reset when interest rates increase in the future. And on average, they offer higher returns than the EE bonds. However, if we enter a deflationary period with low interest rates, the bonds could return zero percent for years, and there is no guarantee that they double after twenty years (like with the EE bonds).